Global VFX market expected to reach USD 19,985.64 million by 2024, growing at a CAGR of approximately 12.78% for the forecast period from 2018 to 2024. VFX abbreviated from visual effects is a process of integrating live-action footage and generating imagery in order to create the environment which looks realistic. The report analyzes and forecasts the VFX market on a global and regional level. The study offers historical data from 2015 to 2017years along with forecast from 2018 to 2024 based on revenue (USD Million). 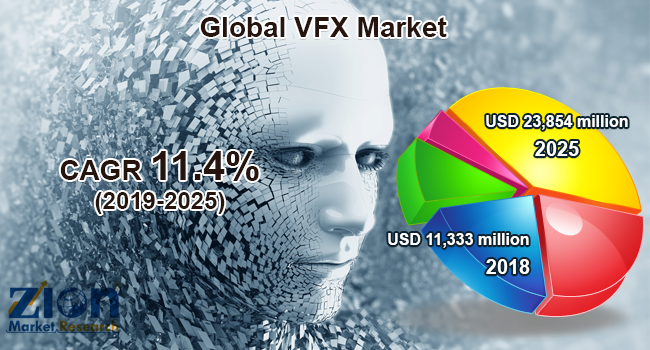 Assessment of market dynamics gives a brief thought about the drivers and restraints for the VFX market along with the impact they have on the demand over the forecast period. Furthermore, the report includes the study of opportunities available in the VFX on a global level. The report gives a transparent view of the VFX market. We have included a detailed competitive scenario and portfolio of prominent vendor’s operative in the VFX market. To understand the competitive landscape of the VFX market, an analysis of Porter’s five forces model for the market has also been included. The report offers market attractiveness analysis, wherein product, end users and regional segments are benchmarked based on their general attractiveness, market size, and growth rate. The study provides a crucial view of VFX market by segmenting the market based on product, end users and regional segments. All the segments of the VFX market have been analyzed based on present and future trends and the market is estimated from 2018 to 2024. Software, hardware, and services are the component segment of the VFX market. On the basis of type, the global VFX market is segmented into matte painting, simulation FX, compositing, and others. Based on application, the global VFX market is divided into movies, advertisement, and TV shows. The market is analyzed based on five regions namely North America, Europe, Asia-Pacific, Latin America and the Middle East and Africa with its further divided into US, UK, Germany, France, China, Japan, India, ASEAN, and Brazil. Some of the major players of VFX market include Blackmagic Fusion, Foundry Visionmongers, Zoic Studio, Animal Logic, Weta Digital, FuseFX, Method Studios, RE: Vision Effects, Inc., Genarts, Absolute Post, Worldwide FX, CoSA VFX, Eight VFX, Whiskytree, Video Copilot, Red Giant Software amongst others.